Nag, nag, nag. That's probably all you think I do with certain book titles. 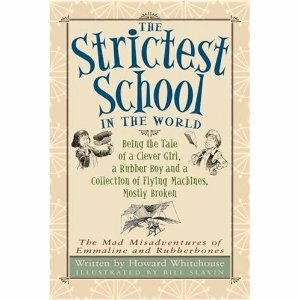 Well, I put my money where my mouth is from time to time and purchased a hardback copy of The Strictest School in the World , Being the Tale of a Clever Girl, a Rubber Boy and a Collection of Flying Machines, Mostly Broken (The Mad Misadventures of Emmaline and Rubberbones) to give away to one of you fine folk this week! Haven't read it yet? Now is just as good a time as ever! To win? It doesn't usually benefit me to be thee first to comment, but it's still fun! You have had me wanting this book for months now! It is also on my Amazon wishlist, too. I hope I win though! Yup, this is one of those books that you keep pushing, and I keep forgetting about (kind of like MBS was for a while until I got smart enough to get them from the library, and LOVED them!!). Your giveaways are super cool this week Carrie! Happiest of birthdays to you!! I remember when you first mentioned this one but haven't gotten it yet so would love to win! What fun! I love your recommendations, and I'd love to win this! It sounds terrific. I'd love to win a copy! I blogged about your celebration! I'm so thrilled about all these contests! I would love to read The Strictest School in the World :) *Thanks* for the giveaway! That sounds like a book my kids would like! I've never heard of this book, but I'd love to read it! sounds like a delightfully clever read! Still haven't read this one. Sign me up! Haven't read it but would love to! Your review makes me want to read this. Please enter me, thanks. I'm game for a chance at winning this book. This sounds like a good book. Please enter me. What an interesting book. I would love to be entered to win it. Thank you for the chance. Oh, how lovely!! I'm hoping we win this sweetie! I would love to read this book! Please include me. Looks like a great book. Please enter me!